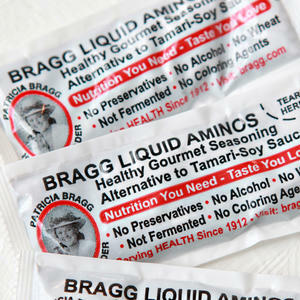 Bragg Liquid Aminos contains 16 amino acids including glutamic acid, lysine, and proline. It can be used as a substitution for soy sauce or tamari, or as a flavoring agent in its own right. It's espicially good in stir-fries and Asian dishes. Bragg Liquid Aminos is not fermented, is gluten-free and is made from non-GMO soybeans and purified water.